John Luchin Jr., left, and John Luchin III work together at the National Museum of the United States Air Force and as adjunct instructors in Wright State’s Public History program. This sentiment echoes in the memories of many men, coming from a distant past when they were first asked what they want to be when they grow up. Our father’s footsteps once seemed huge and appealing — almost impossible to fill. But as life takes its twists and turns, and new interests arise, the paths of a father and son often fork in different directions. This is a story of a father and son who, against these odds, wound up walking side by side, carving out a unique path together at Wright State University. 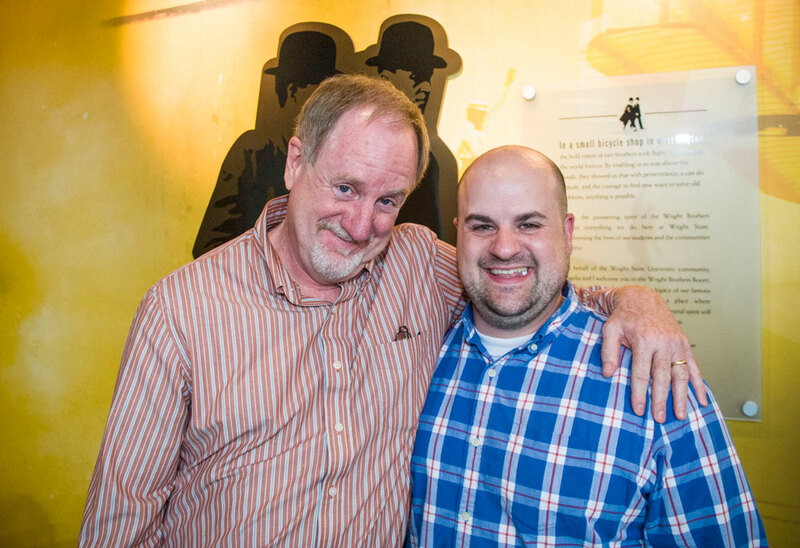 Both John Luchin Jr. and his son, John Luchin III, are adjunct instructors in the Public History program — a family first for Wright State. Both father and son came to love public history in their own way, but it wasn’t always that way. Luchin Jr. had an interest in history from an early age, his son, Luchin III, took a while to come around. “Did I enjoy the trips? No, not at all. I was more interested in art,” he said. Luchin III said a lot of his childhood was spent at antique shows where his father and grandfather sold old relics and antiques. Eventually, Luchin III joined them and sold baseball cards — only because he liked the design and artwork on the cards. His passion for history was sparked later in life, and it came from a little help from his dad. Luchin Jr., who has been obsessed with museums and history for his entire life, was down on his luck a number of years ago when the paper mill that had employed him for 27 years closed its doors. Suddenly, he was faced with a crossroads and had to find another career. In 2004, he applied to Wright State’s Department of History for his M.A. in public history and was soon offered a job at the National Museum of the United States Air Force. 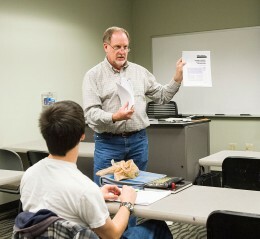 John Luchin Jr., pictured, teaches museum administration and collections, while John Luchin III teaches exhibit design technology. It was at this point the father and son’s paths would converge. After Luchin III graduated from the Columbus College of Art and Design in 2003, he needed to devise a plan to pay off his student loans. He had a chance to get an internship at the National Museum of the United States Air Force to work alongside his father, but he needed to be in school to obtain the internship. So, just like his father, he enrolled at Wright State in 2005 in the humanities master’s program. As he took more and more public history courses, Luchin III found his niche. Once he graduated, he was hired full-time at the museum. A few short years later, both the father and son returned to Wright State — this time to teach in the College of Liberal Arts. Luchin III was hired as an adjunct instructor to teach exhibit design technology in 2011, and his father was hired in 2013 to teach museum administration and collections. Though the apple did not fall far from the tree, Luchin III manages his class quite differently than his father. He said he likes his classroom to be regimented and organized. As for Luchin Jr., his classroom is more laid back — he likes to keep it old school. While both Luchins operate their classes differently, they have the same goal in mind: to best prepare their students for success. Both father and son believe firmly in the benefits of the Public History Plan for M.A. students. Wright State is engaged in a $150 million fundraising campaign that promises to further elevate the university’s prominence by expanding scholarships, attracting more top-flight faculty and supporting construction of state-of-the-art facilities. Led by Academy Award-winning actor Tom Hanks and Amanda Wright Lane, great grandniece of university namesakes Wilbur and Orville Wright, the campaign has raised more than $107 million so far. Luchin Jr. said he and his son work closely together — both at the National Museum of the United States Air Force and in planning lessons for their classes. Together, they’re a well-oiled public history machine showing the Dayton community the importance of embracing historic roots.